All heroes do not wear capes; Tyra Hawthorne, founder of Heartbeat Music & Performing Arts Academy, has made a lot of sacrifices to save the youth. SAN DIEGO, CALIF. — Owning a business during this time is a challenge. But owning a non-profit organization is a true test of faith and determination. Each day non-profit business owners are hoping and wishing that they are chosen to receive the next grant or donation. Lack of funds often causes non-profit business owners to close their doors faster than they get them open. But not for this non-profit business owner. Meet Tyra Hawthorne, the owner of Heartbeat Music & Performing Arts Academy located in San Diego, Calif. Ms. Hawthorne is not any different from the others who have experienced financial hardship due to lack of financial support, but when it came to her choice to keep the doors open in 2016, there was nothing that was going to stop her from doing so, even if this meant giving up her life and sacrificing everything she had to fund the organization on her own with her mother right by her side. “What I have done in this past year and a half, I can say was a true reflection of selflessness. To mentally and emotionally accept letting go of a life that you have built through obtaining your education and securing a career to give children, who would often not get many of these opportunities, a fair chance in this world is truthfully a hard decision to make. What I did was a choice of very personal and uncomfortable sacrifices, but they were the right choices at the right time,” she adds. “The right choice at the right time” is correct as she is slowly seeing the rewards for that decision. A year and a half later, Ms. Hawthorne was offered the opportunity to expand Heartbeat Music & Performing Arts Academy to Atlanta, GA. She will travel for her first major meeting with potential Board Members, Donors, and volunteers in May. With her faith and determined attitude, an organization that she once did not know how she would fund, will now provide Performing Arts education to youth in two major cities! This kind of sacrifice you do not see every day, especially at the care and responsibility of other children. Accepting students as young as four years old, Heartbeat Music & Performing Arts Academy provides a college-prep and professional based curriculum, regardless of age, to prepare students for top college scholarships as well as professional industry opportunities. 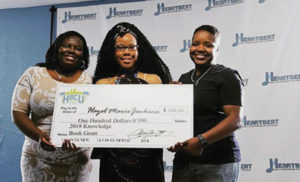 Heartbeat Music & Performing Arts seniors have earned over $30,000 in music scholarships to the top Historically Black Colleges and Universities and Conservatory Music Schools. Heartbeat students are currently featured on Nickelodeon, ESPN, Buzz Feed, Netflix, and Warner Bros. They have danced and trained with industry professionals such as Debbie Allen, Shane Sparks John Silver, Jabari Odom, and Alvin Ailey.